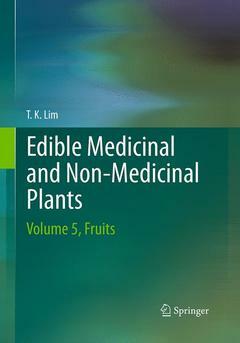 Edible Medicinal and Non-Medicinal Plants Lim T. K.
This book continues as volume 5 of a multi-compendium on Edible Medicinal and Non-Medicinal Plants. It covers edible fruits/seeds used fresh, cooked or processed into other by-products, or as vegetables, cereals, spices, stimulant, edible oils and beverages. It covers selected species from the following families: Apiaceae, Brassicaceae, Chenopodiaceae, Cunoniaceae, Lythraceae, Papaveraceae, Poaceae, Polygalaceae, Polygonaceae, Proteaceae, Ranunculaceae, Rhamnaceae, Rubiaceae, Salicaceae, Santalaceae, Xanthorrhoeaceae and Zingiberaceae. The edible species dealt with in this work include to a larger extent lesser-known, wild and underutilized crops and also common and widely grown crops. To help in identification of the plant, edible parts and food products about 200 coloured illustrations are included. As in the preceeding four volumes, topics covered include: taxonomy (botanical name and synonyms); common English and vernacular names; origin and distribution; agro-ecological requirements; edible plant parts and uses; plant botany; nutritive, medicinal and pharmacological properties with up-to-date research findings; traditional medicinal uses; other non-edible uses; and selected/cited references for further reading. This volume has separate indices for scientific and common names; and separate scientific and medical glossaries. Introduction.- Apiaceae.- Carum carvi.- Cuminum cyminum.- Foeniculum vulgare.- Trachyspermum ammi.- Brassicaceae.- Brassica napus.- Brassica nigra.- Chenopodiaceae.- Chenopodium quinoa.- Cunoniaceae.- Davidsonia pruriens.- Lythraceae.- Punica granatum.- Trapa natans.- Papaveraceae.- Papaver somniferum.- Poaceae.- Avena sativa.- Coix lachryma-jobi.- Echinocloa frumentacea.- Hordeum vulgare.- Oryza sativa.- Setaria italic.- Sorghum bicolour.- Triticum aestivum.- Zea mays.- Zizania palustris.- Polygalaceae.- Xanthophyllum amoenum.- Polygonaceae.- Coccoloba uvifera.- Fagopyrum esculentum.- Proteaceae.- Macadamia integrifolia.- Macadamia tetraphylla.- Ranunculaceae .- Nigella sativa.- Rhamnaceae.- Hovenia dulcis.- Ziziphus jujube.- Ziziphus Mauritania.- Rubiaceae.- Coffea Arabica.- Coffea canephora.- Coffea liberica.- Morinda citrifolia.- Nauclea orientalis.- Salicaceae.- Dovyalis hebecarpa.- Flacourtia indica.- Flacourtia inermis.- Flacourtia jangomas.- Flacourtia rukam.- Pangium edule.- Santalaceae .- Santalum acuminatum.- Xanthorrhoeaceae.- Dianella caerulea.- Zingiberaceae.- Amomum aromaticum.- Amomum compactum.- Amomum longiliculare.- Amomum subulatum.- Amomum tsao-ko.- Elletaria cardamomum.- Medical Glossary.- Scientific Glossary. Common Name Index.- Scientific Name Index.